A cute, white bow napkin ring inspired this shoot. We found it at Brie's parent's house (where we find most of our items) while searching for gold charger plates. 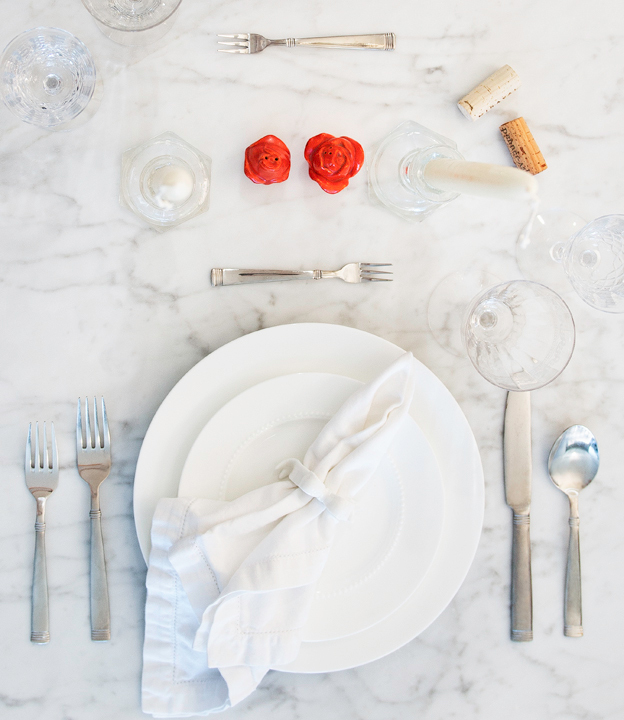 Once we realized the napkin ring had a bow on, we knew we had to incorporate it into a tablescape. Since bows have a feminine appeal, it prompted us to create a romantic tablescape. Creating a romantic ambience with a tablescape is a great way to celebrate an anniversary, birthday, a special announcement or just saying “I love you.” To create a romantic tablescape we focused on white and red colors. The color white is associated with innocence, perfection, a beginning and the new. Red is associated with heat, activity, passion, sexuality, love and joy. Combined with candles and a bottle of wine these colors make the perfect combination for setting a romance ambiance. The table is set with pearl dinner plates from Crate & Barrel, white cloth napkins secured by white bow napkin rings, our grandparents vintage crystal wine glasses and candle holders topped off with ivory taper candles from Heath Ceramics. 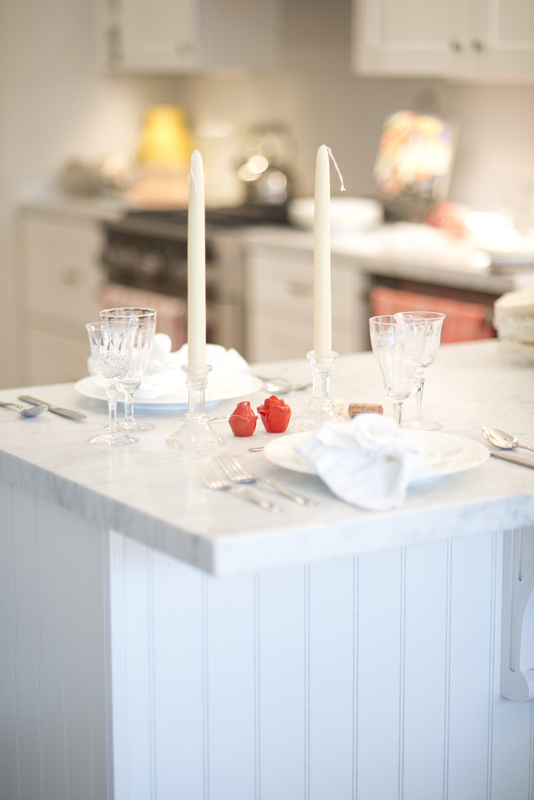 White dishes on white carrera marble countertops, we couldn't resist! Our tiny forks add a formal aspect and are used for dessert. So remember make a sweet treat for after dinner. A mixture of classic china plates with vintage crystal glassware and candle holders set the mood. Vintage red salt & pepper shaker gives this table setting a fun pop of color. Inspired by these white bow napkin holders.